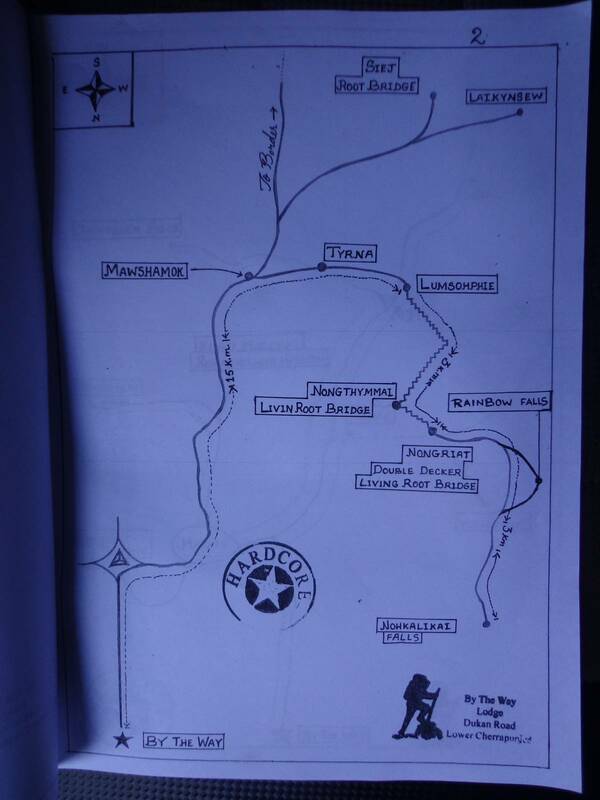 A nice hand drawn schematic map of Cherrapunjee was given to us by the backpacker’s hut owner, Haprit. One of the places was about 18 km from Sohra (local name of Cherrapunjee) and required a descent into the valley via concrete steps. Gowri Sankar joined us for this leg of the trip and we left on a shared cab after our breakfast. “By The Way” backpacker’s hut had this map showing the key areas in and around Nongriat. This small shack in Sohra serves super cheap breakfast. Two chapatis, one bowl of peas sabji and a cup of tea was only 20 rupees. If you think about descending a fleet of stairs, you will realise that each step takes off the weight from the forward leg and you must do a quarter squat on your lagging leg in order to place the forward leg on lesser elevation. After about three-quarter of descent, we found the much advertised living root bridge. 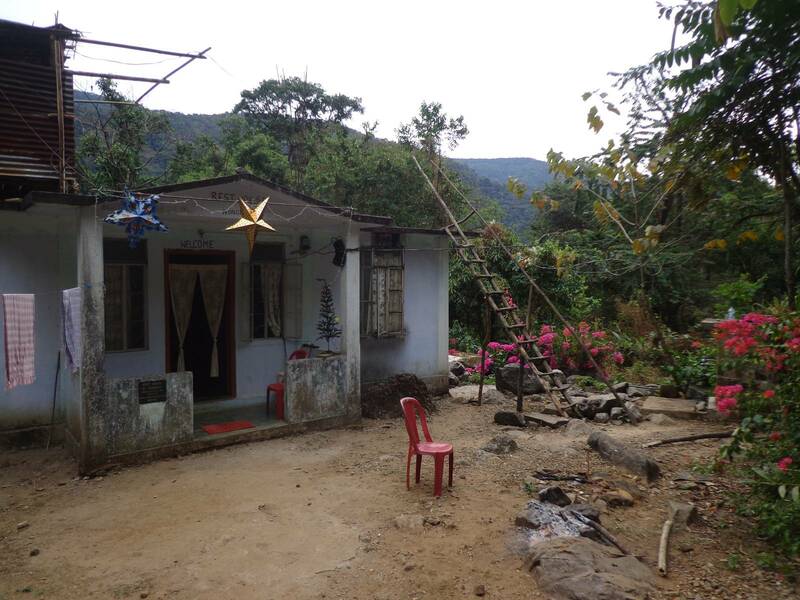 This place is easily accessible and few families were enjoying their vacation. Tyrna is the last motorable point. This is the entry to Lumsophie village. 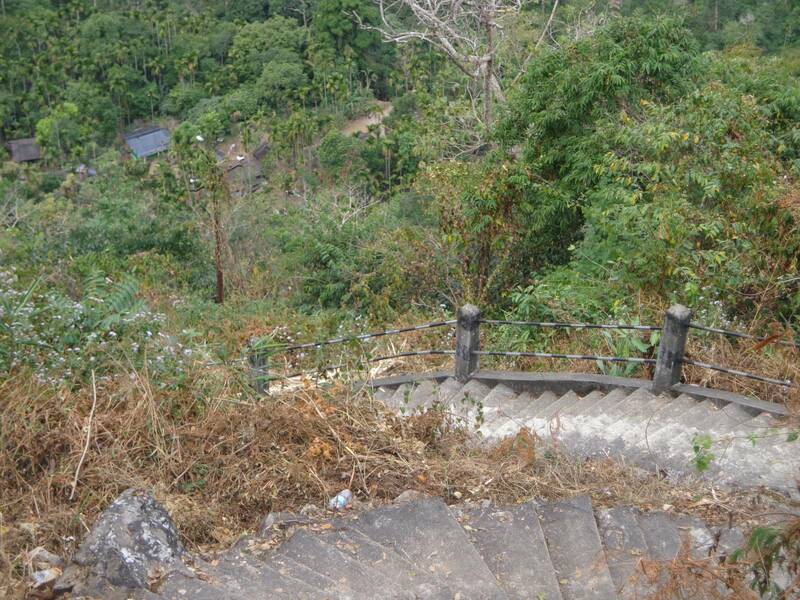 Unending flight of such stairs will make you aware of your calf muscles and your knee joint. 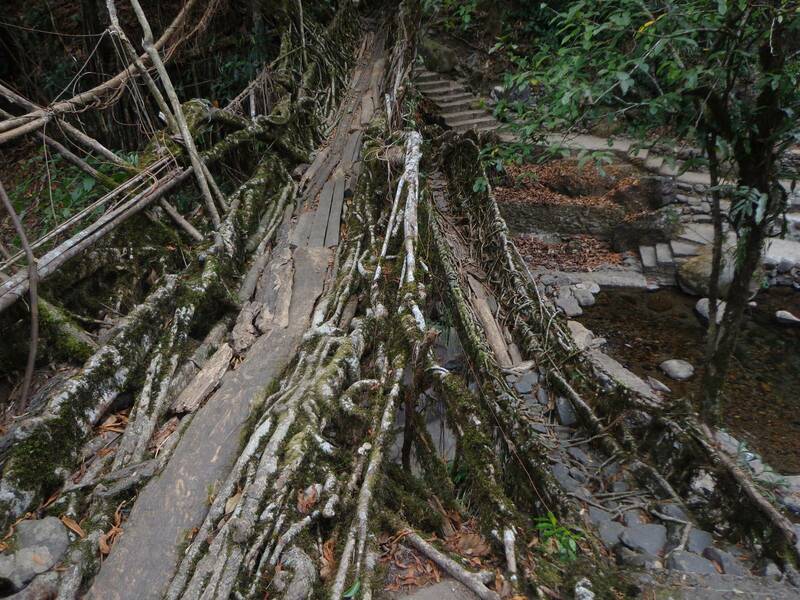 The first living root bridge is located at Nongthymmai. This house in the village collects a nominal entry fee. 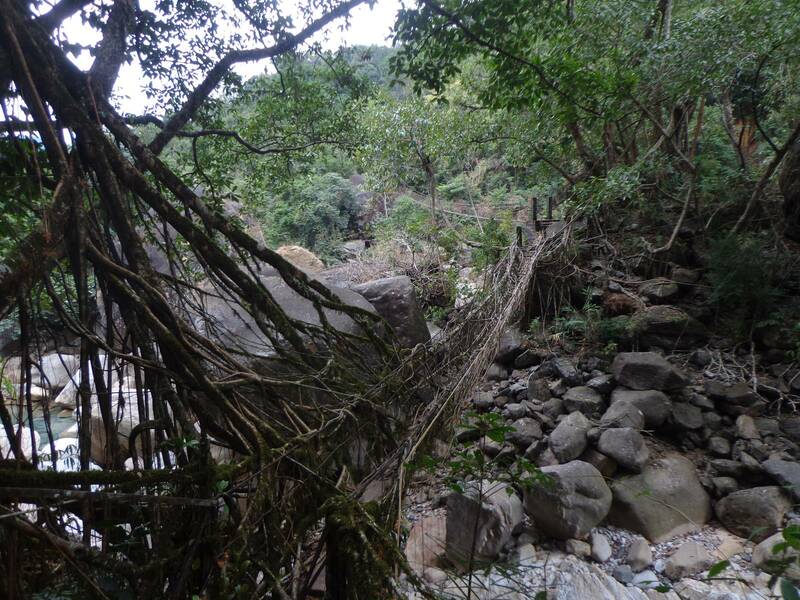 The single decker living root bridge. 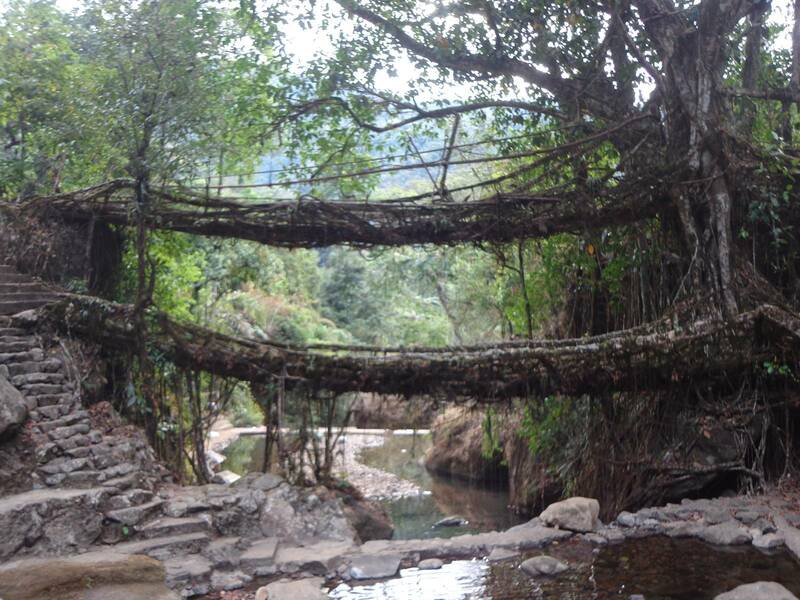 These bridges are constructed by “guiding” the roots using wooden or metallic frameworks. The bridge, up, close. These roots are deceptively sturdy. 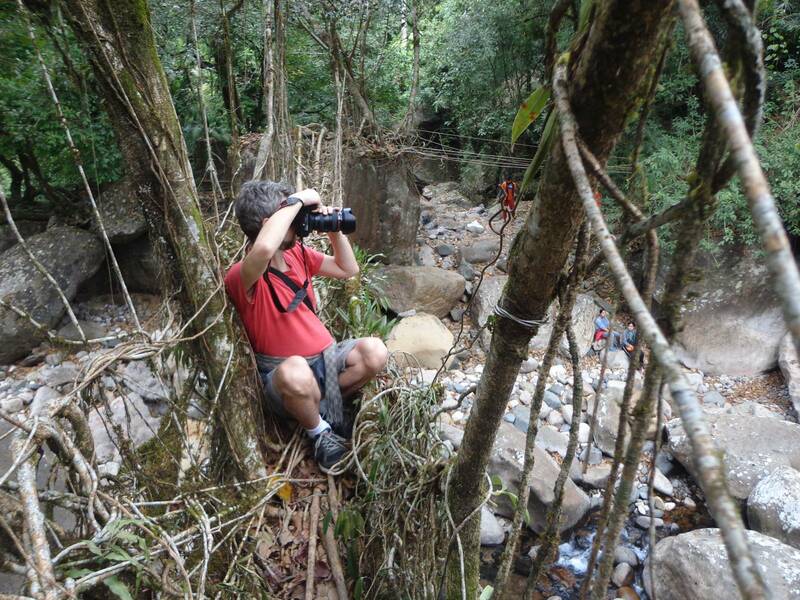 A living root bridge with damaged railings was the perfect spot for this Australian photographer. Years of falling water has caused cavities in a rock below the bridge. In summer this place is completely submerged. A small detour threw us on a lesser travelled fleet of stairs. 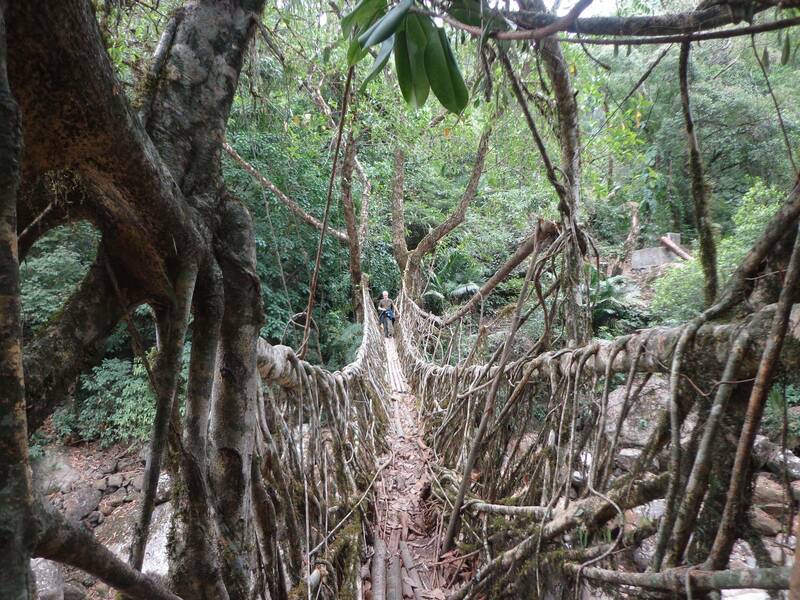 There are about 3000 steps to Nongriat, a village that has a double decker living root bridge. 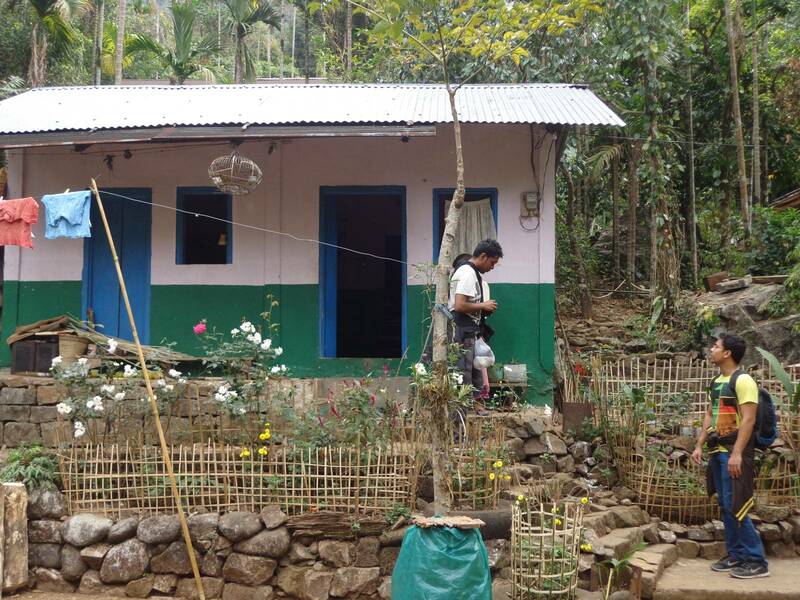 It also has a nice rest house run by Tony, a local Khasi boy. 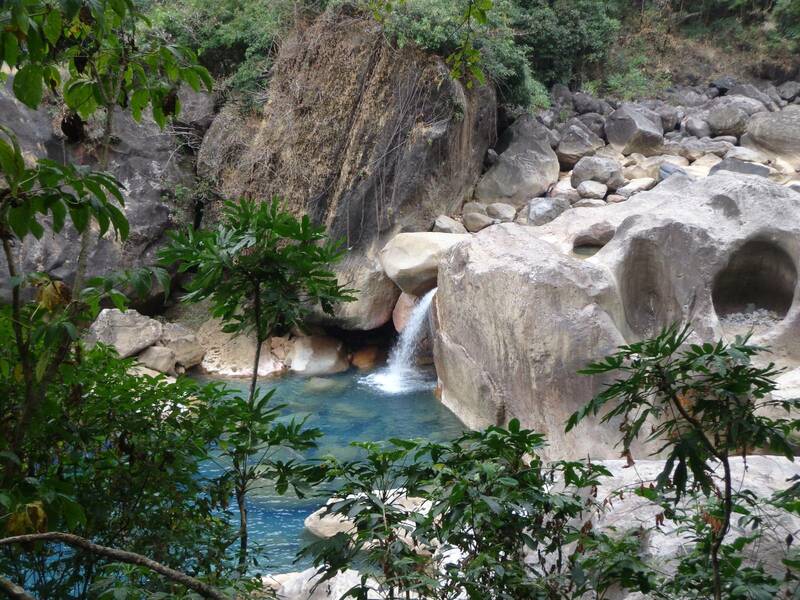 Nongriat can also be a nice anchor point for trekking in and around the falls and caves. 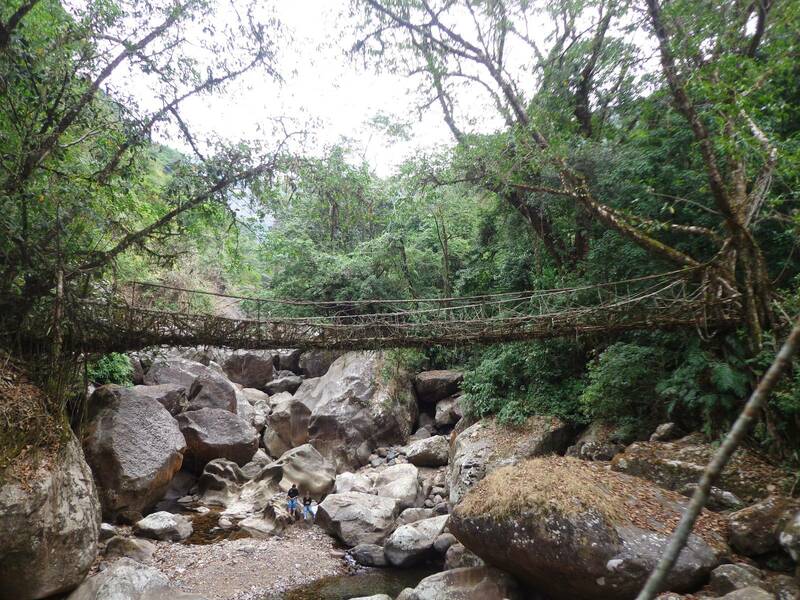 There are regions where modern cable bridges have replaced the traditional living root bridges. 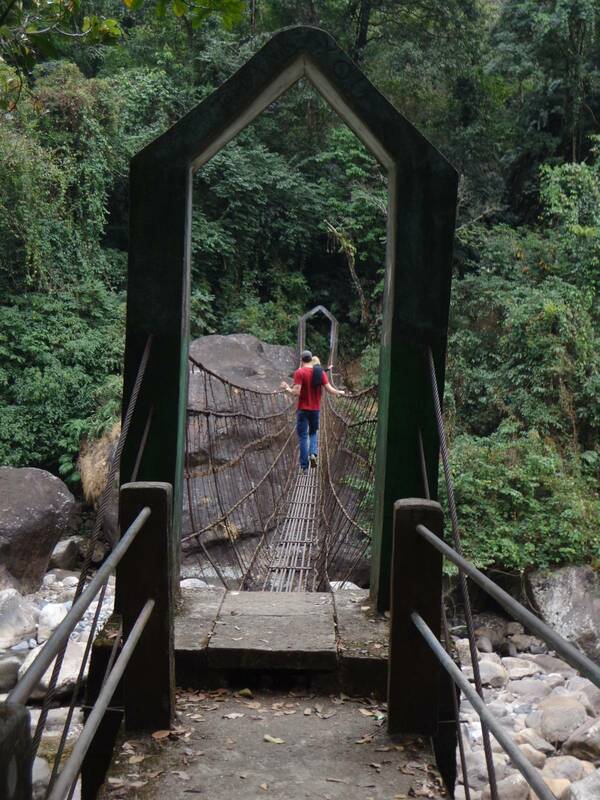 The double decker living root bridge at Nongriat. The two decks are staggered to make way for stairs that connect these levels. Tony’s rest house is 1 minute walk from the double decker bridge. What do the locals (and the Finnish and Russians) do? Khasi language historically had no script. Christian missionaries introduced Latin script for written Khasi. As a result, this region has 95% Christian population. Also, most people are literate and can communicate very well in English, even if they are from the remotest village. 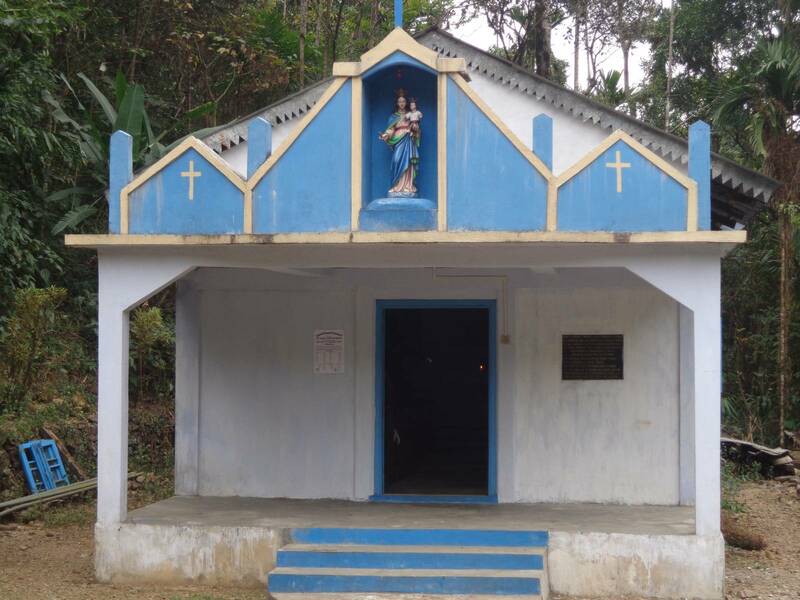 Small church like this is present in every village. We even got to see a mass since it was a Sunday. 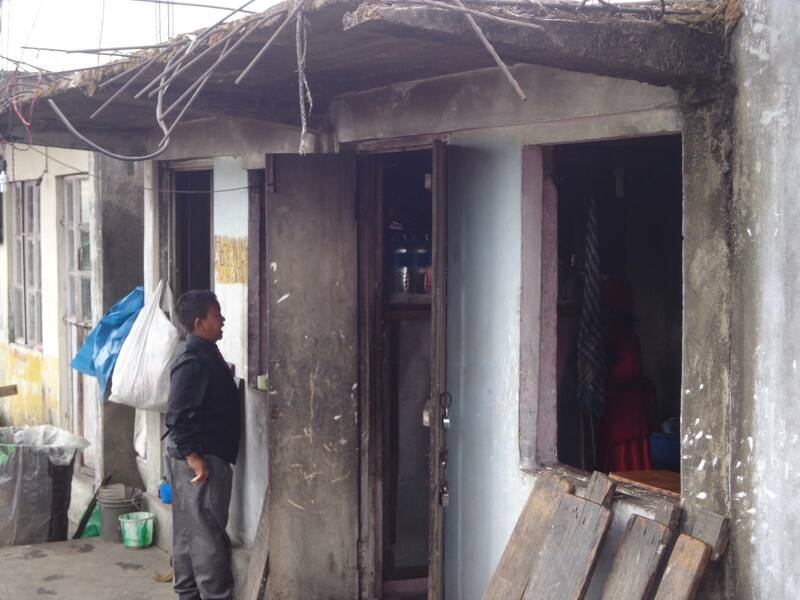 The locals in and around Sohra run small businesses or do manual labour. 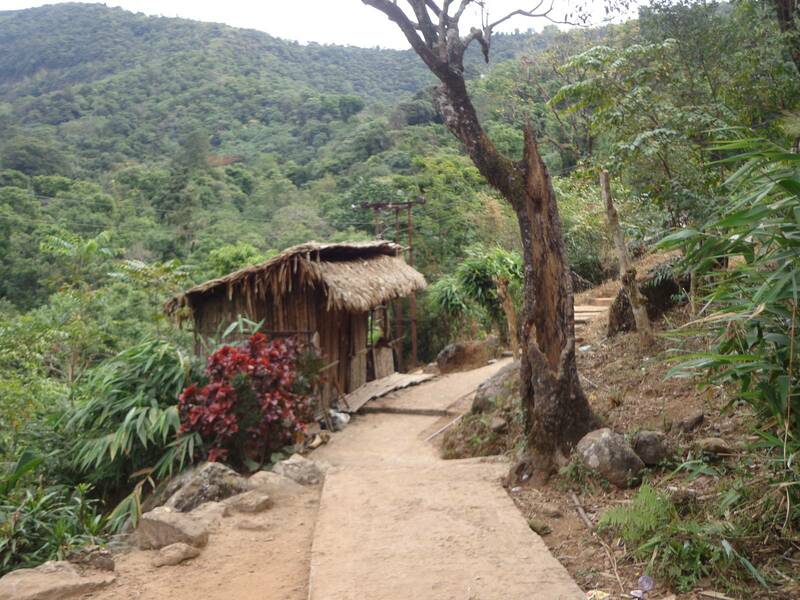 The villages like Nongriat, located in the lap of mountains, have some natural resource that they can exploit. They cultivate fruits and sell them at Sohra once every week. This is known as Market Day. Market Day repeats itself in eight days. It is also an opportunity for the 300-odd villagers to restock their ration. Transportation from Tyrna is hard manual labour. 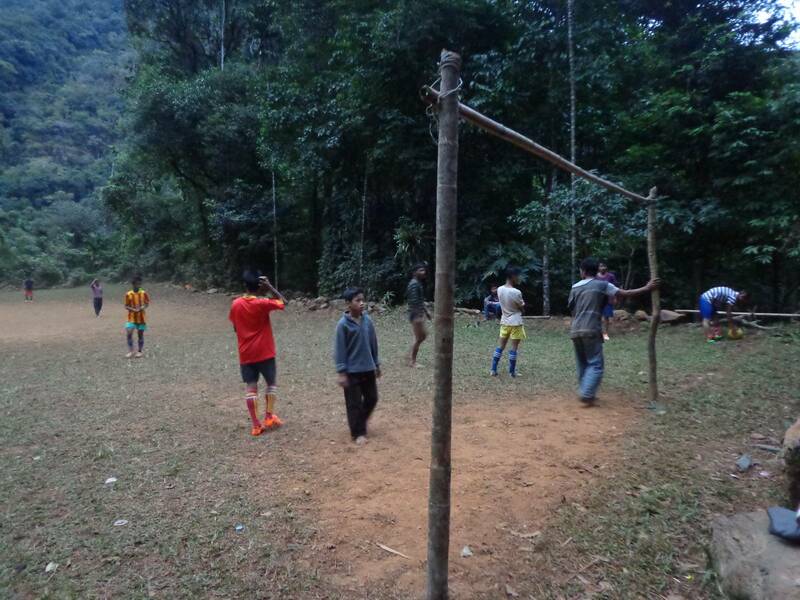 The guys were having a football league in a small field – one of the few flat spots in Nongriat. This league is supposed to run till 24th December. The winning team gets 1500 rupees. After that, it is party time for all the players irrespective of the winner and loser. Our host Tony’s team won today. One of the players of the losing team kept falling every now and then and was funny to look at. Tony was happy that he wasn’t on his team since the falling guy had obtained his falling superpowers from a lot of alcohol that he had consumed before jumping into the game. Nongriat Christmas League in progress. The locals are super friendly with the foreigners, too. Two foreigners, one Finnish and the other Russian, have been backpacking through out the world and have bumped into each other multiple times. We sat by the bonfire and had a long chat. They had been trying to trek through the forest to get back to Sohra (a lesser known route) but got lost in the process. Instead, they got back to the rest house and sipped on an indigenous cocktail which they named as Jungle Adventure. Tony took a few sips, too. He and his brother were silent listeners and not active participants. 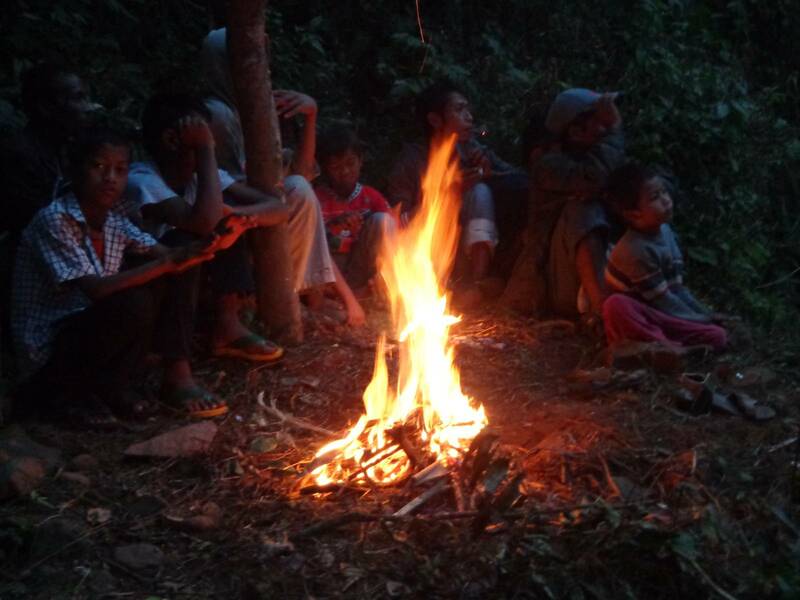 Nongriat locals enjoying a bonfire. The weather is not as cold as Shillong or Cherrapunjee. Tony is also an excellent cook. So is his relative (Dansing a.k.a. second Boss) and his father. On a side note, the Russian guy was of the opinion that Indians don’t read much. Comparatively, it is true to some extent. I was able to dispel that myth, albeit superficially. I grew up on Bengali translated Russian books. That was a surprise for him. By the time we had settled in Nongriat, it was already 2 O’clock. We asked for the distances to various places from the rest house. Rainbow Falls seemed like a good place to go since Tony said that it was a one hour trek. The travel itself would take two hours and we will have a thirty minutes window to enjoy the view. There is no daylight beyond 4:30 pm. So it is advisable to return to familiar territory by then – just as the Russian and the Finnish guy had done after their failed expedition. Tony had asked us to take a concrete stairway after a living bridge. He did not mention that the stairway after some 700 meters is under construction. Beyond that one has to rely on his trekking skills to manoeuvre around. En route, a bluish puddle of water, peeking through the forest leaves, caught our eye. We even traversed a compound bridge while walking towards Rainbow Falls. Half of it is cable bridge and half of it is roots. A bluish puddle of water, peeking through the leaves, caught my eye. Rainbow* Falls was a disappointment after the effort we had made to reach there. It was expected. During monsoons, this fall is massive. 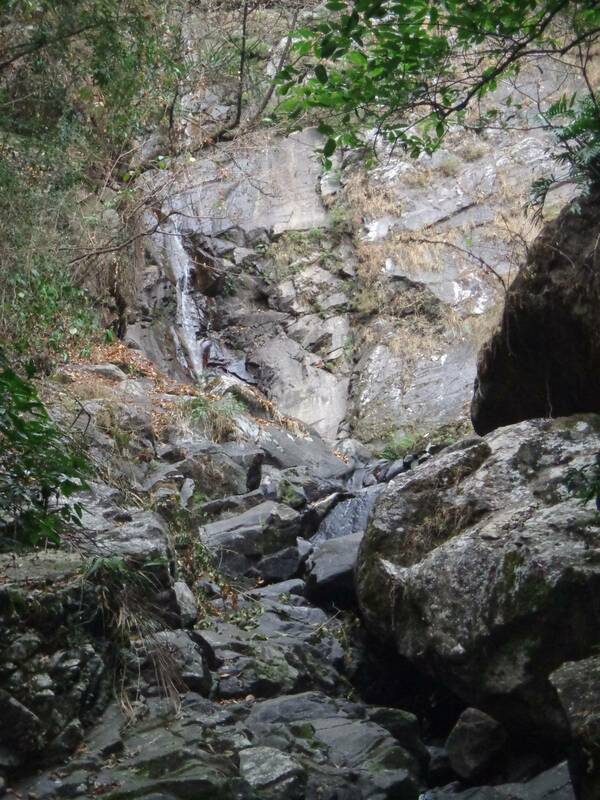 Right then, it was more like a stream trickling down a vertical rock wall. Rainbow* Falls during winter is really a thin stream. 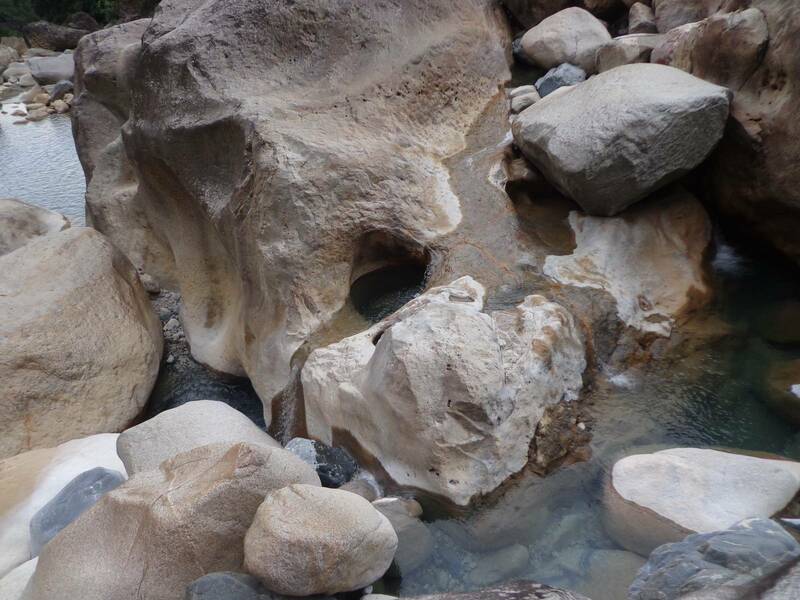 These rocks form the bed for the water stream that flows from Rainbow* Falls to the valley. We decided to follow the water trail. 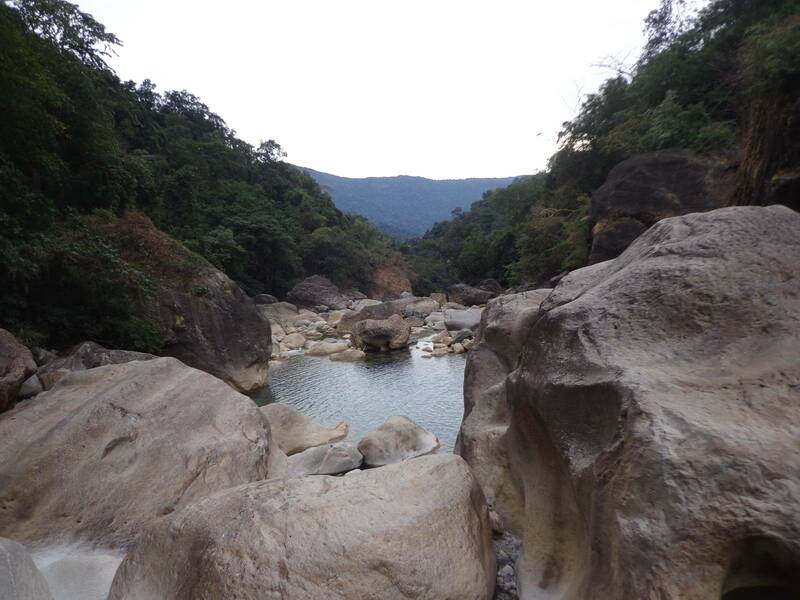 We decided to follow the rocks downstream, hoping to get to the more interesting water body we had seen earlier. This involved part trekking, part rock climbing and part parkour. This was possible because there was no water. 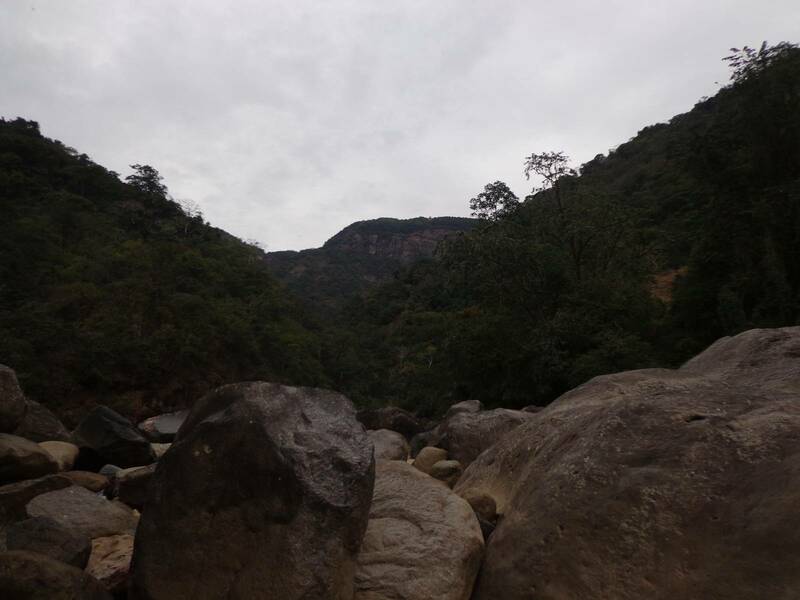 During monsoons, the same route we took to reach the puddle would be under a stream of water gushing at 300 kmph. It was well worth the effort. 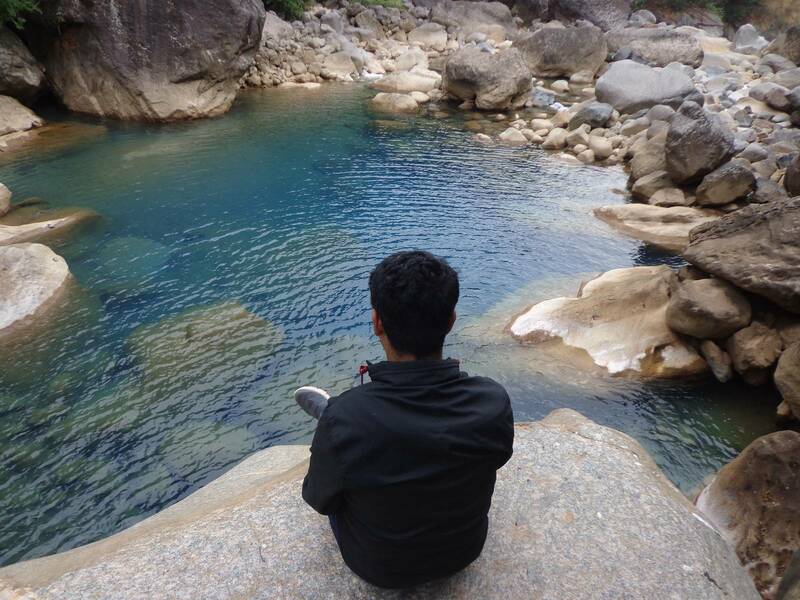 Sitting on a giant rock, overlooking a blue pool in the middle of a silent valley; it was paradise. During monsoon, the valley turns violent. 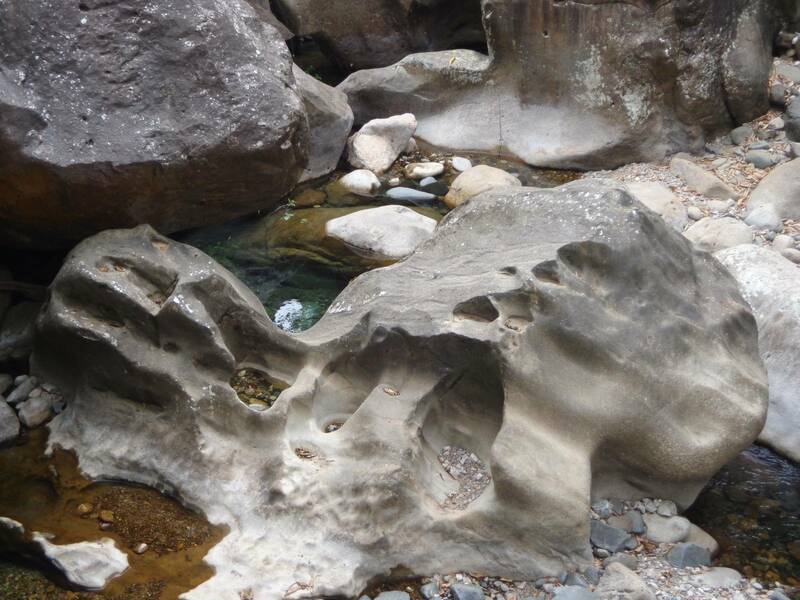 These massive rocks have water gushing over them. 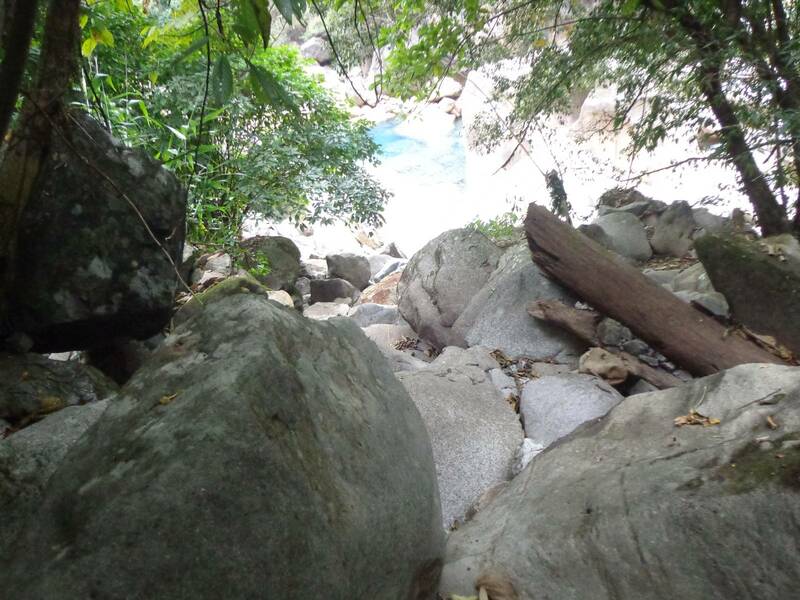 A bit of parkour is needed to traverse from one rock to another. A view of the valley. Imagine, during monsoons, I would be under a 300 kmph stream of water right at that point. Here’s the strange news. I came back and showed the pictures to Tony. He said that we had gone somewhere else and he didn’t know where. Rainbow Falls is supposed to be huge. A paradise is paradise no matter the place. In this entire post, I have placed an asterisk to denote Rainbow* Falls is not the same as Rainbow Falls. Tony also clarified that when he said one hour, it was not from the rest house but the end of the concrete stairs construction site. If you are a cocktail enthusiast, the Finnish guy even shared the recipe. Pour 2 parts of “cheap quality” whiskey, 2 parts of “local” lemon juice, 4 parts of “local” water and 2 spoons of “local” honey into a 500 ml empty bottle of Coca Cola and then shake it vigorously. Distances can be a bad metric to measure the effort required to travel between two places. People tend to use time instead. Addendum : Nongriat has no connection barring BSNL and Aircel. Getting even a 2G connection was a problem.